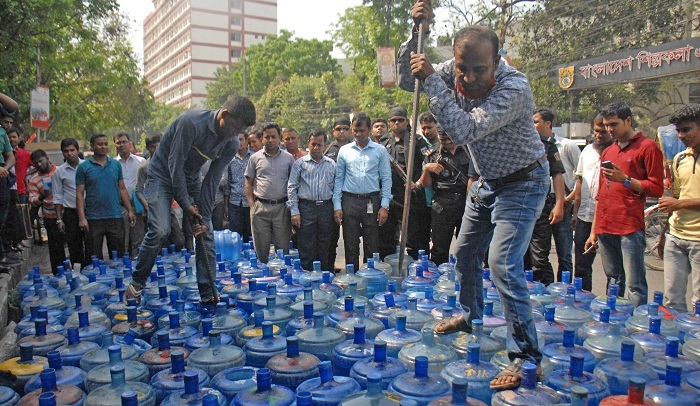 Bangladesh Standards and Testing Institution (BSTI) shut down two jar-water producing factories and destroyed 4,500 jars of filtered water in the capital on Sunday. The water jars were destroyed during a mobile court drive in Paltan and adjoining areas against the sale of unpurified water in water jars without any valid licence or approval. The mobile court, led by Executive Magistrate Sarwar Alam, sealed the two factories involved in supplying water jars of unpurified water without valid licence from the government and fined them Tk 4, 00,000. A total of nine people were sentenced imprisonment in the operation. The factories which were found guilty in the drive are Winner Drinking Water, Limuka Drinking Water, Dighi Drinking Water, Aqua Blue Drinking Water, and Masafi Drinking Water. In previous raids by BSTI, it was found that these so-called filtered water jars supplied to households, shops and offices in and around the capital contained pathogens from faeces of human and animal. The business of unsafe jar-water has flourished across the country over the years, especially in the capital and other urban areas, in the name of safe water, posing a serious threat to public health.